After a long day of working like a field hand picking through and cleaning raw fleece I was still somehow able to clean up and make a huge sushi dinner. No excuses folks, you can do it too! It really is simple. I learned to make simple rolls while I was still in highschool. Never too young to learn how to make a decent tasty roll. I’m sure even my 5 year old nephew could put together a sushi roll. It is simply not as intimidating as you might think. Now if you want to make true sushi art like the pros…well, that is a different story. Start simple! My method for making simple sushi rice is already outlined in my onigiri post. The salmon filling I describe there is also a very delicious sushi filling. 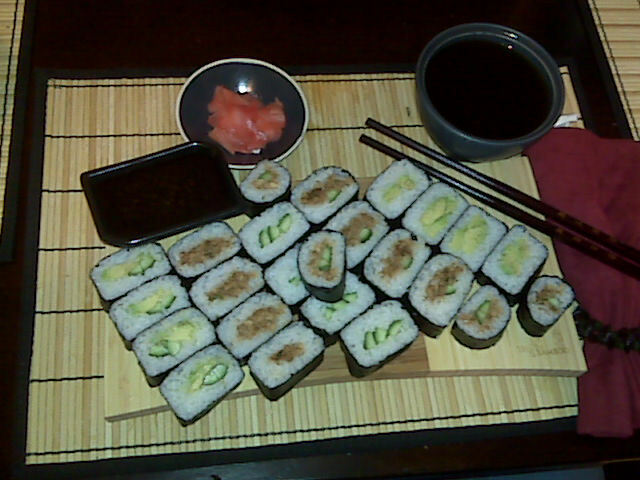 Other sushi fillings I used in this particular dish were cucumber/wasabi, avocado, and cucumber/avocado. The soup is simply a low calorie yet filling consomme. The pink stuff is pickled ginger. Not everyone loves the stuff but I do. I put a bit on each piece of sushi for a bit of kick. Not a lot of calories in pickled ginger really. Place your bamboo mat on a flat surface. You can get bamboo mats almost anywhere these days. I’ve even seen them at the superstore! Keep a measuring cup filled with 2 cups of water and a splash of rice wine vinegar on hand. Place a sheet of nori on the mat with one of the longer sides down. Dip your fingers in the vinegar water. Grab a handful of rice, spread that rice on the nori sheet so that it covers 3/4 of the sheet. Make a little shallow channel about an inch away from the bottom of the sheet that runs parallel to the bottom. Put some filling of your choice in that channel. You should have a line of filling. Don’t over fill. Wet your fingers again with the vinegar water and dampen the uncovered part of your nori. Lift the bottom part of the mat with your thumbs while you keep your filling and rice in check with your fingers. Roll the mat while tucking the rice and filling into your roll. Apply a bit of pressure to help it all stick together. Not too much ofcourse. Make sure you roll the whole thing together. The dampened nori will seal it like an envelope. Tada! You have a sushi roll! To slice it make sure you use a nice sharp knife and dampen the edge with the vinegar water frequently to keep things from sticking. Just to name a few. You get the idea though. Sushi can be so much fun and there are always new combinations to be tried. This entry was posted in Dinner and tagged rice, salmon. Bookmark the permalink.